Marty Nemko had me on his NPR-San Francisco KALW program today to debate federal job training reform with Stephen Baiter, the executive directory of the Workforce Development Board of Contra Costa County, California. Marty wanted a civil debate, so we didn’t bust any chairs over each other’s heads. 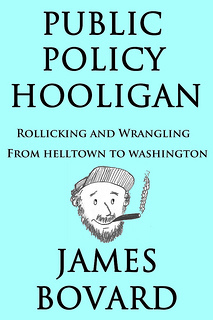 I have been writing about federal job programs sporadically since the early 1980s. Marty mentioned this Wall Street Journal piece I did in 2011. Here’s a page with links to my 1980s/early 1990s job training critiques. Stephen has faith that the programs can run well. I have no faith that the feds can fix a program they have bungled for more than half a century. Stephen and Marty both urged me to come up with constructive suggestions. But I’ve seen the feds try practically every reform in the book – and still shaft would-be trainees. Doing harm is worse than doing nothing. For generations, politicians have won applause by promising to give young people valuable skills and betrayed them year after year. Federal job training is a prime example of the incorrigibility of a government intervention. I cited several evaluations of federal programs which showed that “training” actually reduced participants’ subsequent earnings. Marty suggested that rather than relying on past evaluations, we should use logic to come up with a better program. I laughed and said it was a peculiar type of logic that begins by disposing of the evidence. UPDATE: Stephen Baiter, the government job trainer, sent me a series of angry Twitter messages after the show. His comments during the debate often seemed to be an endless series of prefabricated phrases, presumably pre-approved by the U.S. Department of Labor. 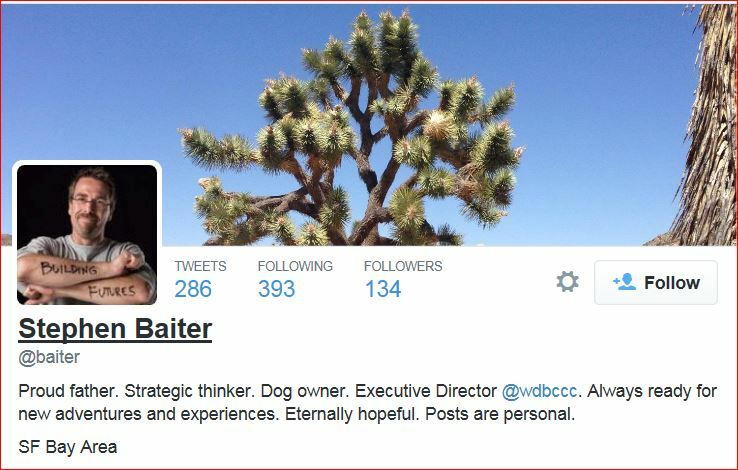 In his Twitter profile, he describes himself as a “Strategic Thinker.” You be the judge. Apparently government job trainers believe that there is a statute of limitation by which they have no obligation to learn from the mistakes of earlier decades and prior programs. @baiter Label critics "pathetic" in lieu of learning the lessons of past federal training failures? Your $$$ comes in – No sweat? Nick Loret de Mola, a Sacramento lobbyist for the California Workforce Association – the organization that keeps tax dollars flowing to local training bureaus – chimed in late night. Have you ever noticed how bureaucrats live in the past tense? “Learning has occurred… has moved forward.” Obama was using present tense last year to deride federal programs as “train and pray” shoot-in-the-dark operations that have little idea whether trainees actually benefit. But apparently all of that is ancient history and we are supposed to blindly trust that bureaucrats have quietly fixed all the problems that they perennially denied existed. @NicknSacramento @baiter So Obama was lying last year when he characterized govt programs as "train & pray" with little idea who benefits? This #boomer hashtag is apparently considered a deft refutation by these California officials. I have never understood bureaucratic logic. Thank you. I can put these in the “save for personally known examples” box when demonstrating the “ad hominem” logical fallacy to my students. Hard numbers talk. Petty name calling walks. We can’t trust you, Lawhobbit, ’cause you’re a Boomer. Or a near-Boomer. “Irregardless” of Mr. Bovard’s repertoire of snappy retorts, one has to admit Stephen is a Master Baiter…. Ross Levatter My apologies in advance, James, but I cannot stomach listening to 2 Lefties talk for 40 minutes even if it allows me to hear 20 minutes of your gems. More power to you for putting up with illogical crap. Jim Bovard Ross Levatter, no sweat. It’s a beautiful Sunday around here – a good day to get out & enjoy. James Babb I couldn’t actually follow what your opponent’s point was. The host was at least generally coherent. “This time, we’ll have smart people pass out the loot” seems to be his solution. Good luck with that. James Babb If Baiter did make any coherent points, it may have been while my eyes glazed over and I drifted in and out of consciousness. Jim Bovard James Babb, thanks for listening. I think the other guy was saying the system was working just fine. I enjoyed asking him if there were any federal Labor Dept. rulings or bizarre flip-flops which he would criticize. I don’t think that was his favorite part of the interview. Philip J. Crincoli Sr. Good show. King Solomon??? I didn’t know you wuz Jewish. Jim Bovard Thanks for listening! I have been called many things over the years but “Solomonic” is not high on the list of accolades. Brad Smith We need a new Latin phrase for this type of logical fallacy. You know, the argument that goes like this. “If we had only done more it would have worked”. If we had only sent more kids to die in the war we would have won!! If QE2 would have been big enough it would have worked, etc etc etc. Philip J. Crincoli Sr.’s photo.